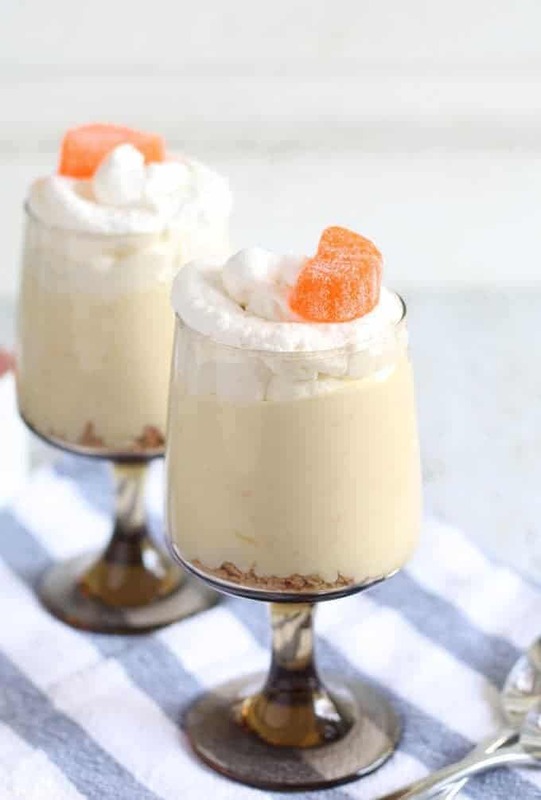 This no-bake dreamsicle cheesecake recipe is the best way to enjoy your favorite frozen dessert (besides the real thing!) Perfect for summer! I fell in love with the idea of no-bake cheesecakes back when I made this delicious blueberry cheesecake. It seems ever since then, I can’t stop making them. What’s that saying, “Can’t stop, won’t stop?” Yeah, that’s totally me. In the summer, the last think I want to do is turn on an oven but I still crave some of my favorite desserts. The way to fix that is no-bake, all the way. I have concocted the most delicious and easy-to-make no-bake cheesecake mixture and it is perfect for hot days. It is also pretty good for lazy days because it doesn’t require a lot of work. Also, it is very forgiving if you make a mistake – not something you will hear me say about anything that goes in the oven, ever. Begin with 2 packages of softened cream cheese. It’s important that the cream cheese is very soft, otherwise your finished product will be clumpy. Beat the cream cheese until it is smooth, either with a mixer or a food processor. Then add your orange juice and orange zest. Mix this up until everything is well-combined and then slowly add your powdered sugar. When everything is well combined, turn off your machine. This recipe makes 4 large individual cheesecakes. If you want to make smaller portions or more portions decide now cause we are starting the assembly process. Decide what vessel you want to use to set up your cheesecakes. I like stemless wine glasses and mason jars for my no-bake cheesecakes. In the bottom of each glass, evenly place 2 tablespoons of graham cracker crumbs. Then distribute the cheesecake mixture into the glasses so that it is evenly distributed amongst your vessels. It’s okay if it’s not perfect – just try to get it close. Put the glasses in the refrigerator to chill and set for 2-3 hours. Now you can go relax for a little bit or get dinner ready. Need a dinner idea or two – try this one pot spicy sausage skillet or my one pot tomato pesto pasta. If you are using store-bought whipped cream, you can rest the entire time. If you are making whipped cream, start that about 20 minutes before your ready to serve dessert. The whipped cream should go on top of the cream cheese mixture right before you serve. I garnished mine with an orange sugar candy – you could also garnish with more orange zest or skip the garnish all together. 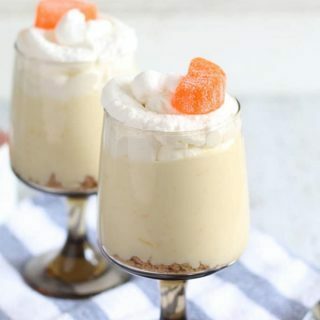 No one will notice if the garnish is missing, because these no-bake cheesecakes are so delicious. This no-bake dreamsicle cheesecake recipe is the best way to enjoy your favorite dessert (besides the real thing!) Perfect for summer! 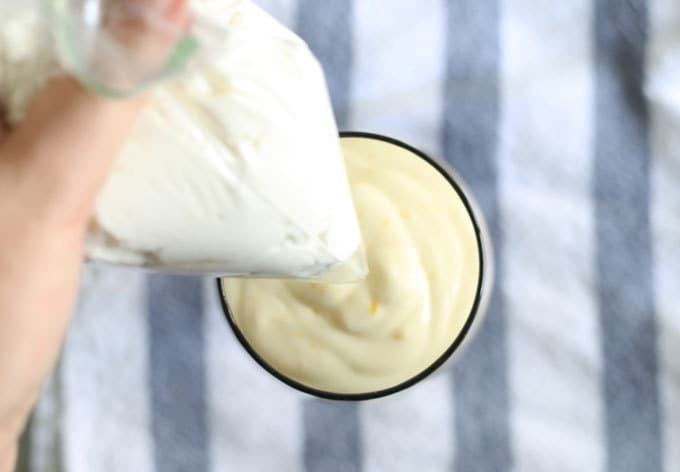 Beat the cream cheese in a stand mixer, on medium, or food processor until smooth. Add the orange juice, orange zest and vanilla extract. Pulse/mix until everything is well-combined. Then slowly add the powdered sugar. When everything is well combined, turn off your machine. In the bottom of each glass, evenly place 2 tablespoons graham cracker crumbs. 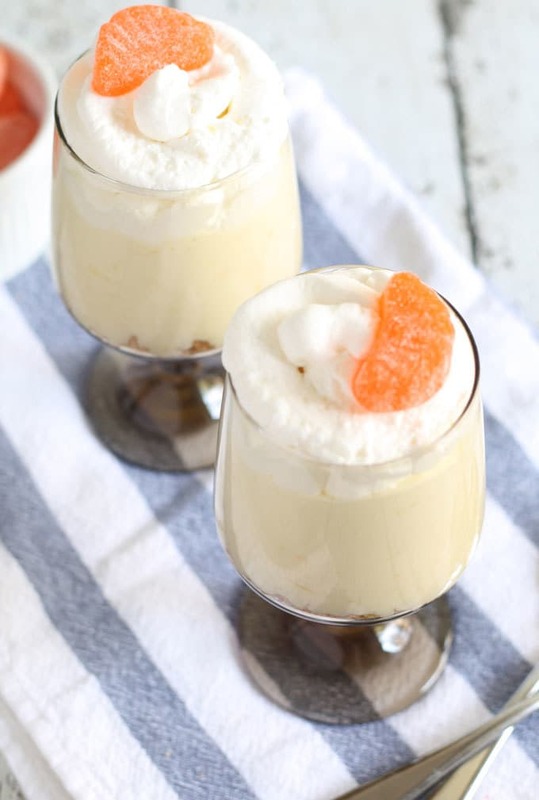 Distribute the cheesecake mixture into the glasses so that it is evenly distributed amongst your glasses. Put the glasses in the refrigerator to chill and set for 2-3 hours. After the cheesecakes set, top the cream cheese mixture with whipped cream. Garnish with an orange candy. 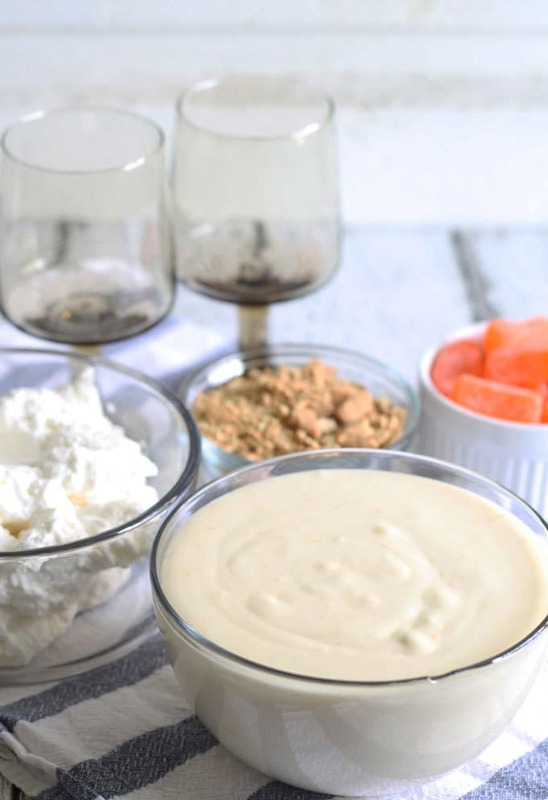 Taste the cream cheese mixture before assembling to see if you want to add an additional teaspoon of vanilla extract. Need some more dessert ideas? These sound and look like the perfect beat the heat treat! This cheesecake looks fabulous. I have never tasted anything dreamsicle that I didn’t like. Thank you for sharing at Tasty Tuesdays Archives link party. Pinned and Shared. 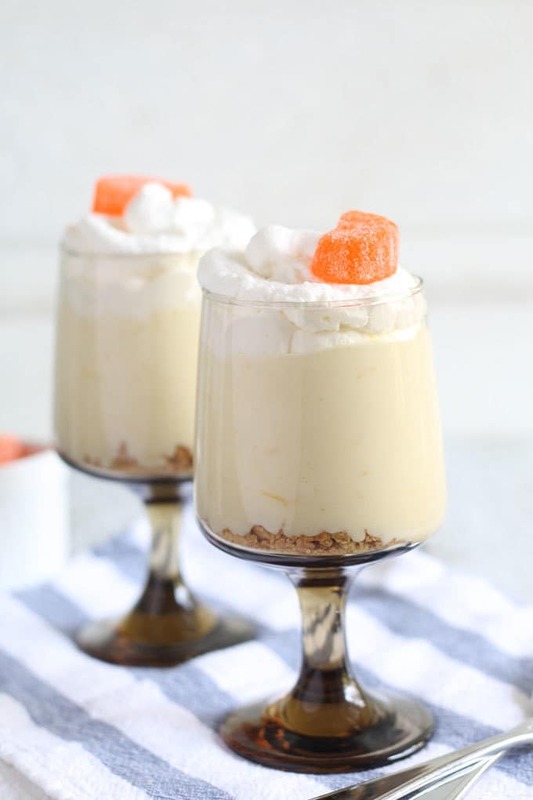 Your No Bake Dreamscicle Cheesecake sounds delicious! Thanks for sharing at Snickerdoodle. This was the Most Clicked from our last party and all of the party co-hosts will be featuring it today. It will be in our party reminder email, too. Oh my goodness, I just pinned your awesome dessert and can’t wait to make it! I sure appreciate you sharing with us at Full Plate Thursday. Have a great week and come back soon! Looks so yummy! I love that it’s no-bake too! Yay! They are a little bitter using just the recepie. I’d reduce the zest to 1 tsp and be sure you shake your OJ before measuring and pouring it into the ingredients. Also increase powdered suger by /2 cup to help counter act the bitter.